I use a blend of the Raw foods method and the Traditional Chinese Medicine method to gently dehydrate and encapsulate the placenta, which is preserved after delivery. Within a few days following the birth, I will begin the encapsulation process which is finished in 24-48 hours entirely. 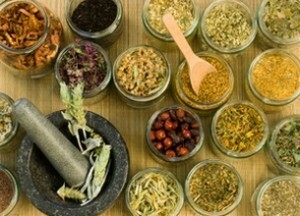 The capsules I use are gelatin-free (vegan) and I infuse a number of high-quality herbs for further benefit. I order all of my herbs from the very trusted Mountain Rose Herbs Company. The capsules can then be taken daily for a number of weeks, and when you have recovered from birth you can freeze and save some for menopause and other purposes. Blossoms of Health blend: Red Clover herb, Nettle leaf, Ginkgo leaf, Red Clover blossoms, Meadowsweet herb, Calendula flower, Gotu Kola, Lavender flower, Chamomile flower, and Stevia(*ALL herbs are Certified Organic). 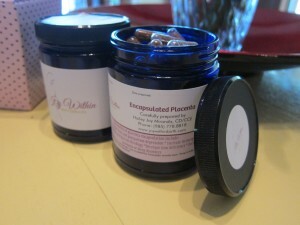 This blend is infused in your placenta capsules for a delicious taste as well as for uplifting energy. *Please see my blog to learn about the special and unique quality of each herb infused. 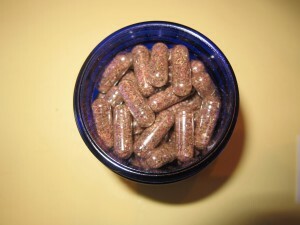 One placenta can produce 75-200 capsules depending on the size. You reap all of the healthful benefits of placenta quickly and discreetly, and the capsules – kept in the refrigerator – will last indefinitely (for years). When you choose placenta encapsulation, you replenish your body with your own natural iron, protein and essential hormones needed in the postpartum period. Placenta capsules lessen postnatal bleeding, replenish depleted iron, impart energy, help with breast milk production, and assist your uterus to returning to its pre-pregnant state. When stored in the freezer, your capsules can be used at a later time to help with difficult menstrual cycles, by reducing bleeding and cramps. Capsules can also help with symptoms of menopause. The placenta can be mom’s gateway to wellness postpartum as it contains high levels of various vitamins, such as B6, which can help curb postpartum depression. Consuming the placenta gives mom back all those nutrients she was providing for her unborn baby. Eating the placenta also increases a mother’s blood levels of a hormone known as CRH (corticotropin-releasing hormone), a known stress-reducer. This hormone is normally secreted by the hypothalamus. Studies have also shown that eating the placenta can also increase milk production, and slow postpartum hemorrhage. How many to take in the postpartum period depends on the mother and her needs. I recommend 3 capsules twice a day for two weeks. If mom has a history of PPD I recommend 3 capsules three times a day for a full two weeks. The following week she can cut back her capsules to once a day or two capsules twice a day. If mom is feeling run down, fatigued, low supply or emotionally fragile increase dosage. You can always take more a few months down the road if you need a “pick me up”. The fee for this service is $150.00 (plus travel for outside of St. Tammany Parish) for non-doula clients and $100.00 for doula clients. I would be happy to work out a payment plan that would be completed by the date of encapsulation. Please visit Pricing for more information. You only get one placenta! Enjoy the healthful benefits! Welcome to Joy Within. Here you’ll find resources and services offered by Hailey Aliff, CD, CCE, in the quaint town of Covington, Louisiana and its surrounding areas. As young as three years of age Hailey began attending homebirths with her mother who was a midwife. She has a wealth of experience in the field of pregnancy, labor, and delivery and is now a student midwife herself. She feels privileged to be involved with the momentous occasion of pregnancy and childbirth and sees her doula work as a calling. Take a look around the site to find out more about each of her offerings, find gift certificates here, and contact Hailey to see if she can be of assistance to you. Someone please tell me! WHAT IS A DOULA?? !